Our strategy topic for the November 2012 focused on where the future leaders of law firms will be coming from. There is a simple industry wide issue relative to generational demographics. A very large cohort of baby boomer partners will be retiring over the next 20 years. In fact, by 2020 (eight years from now) half of the boomer cohort will be 65 or older. If you look at the broader demographics, the generational cohorts create something akin to a roller coaster. 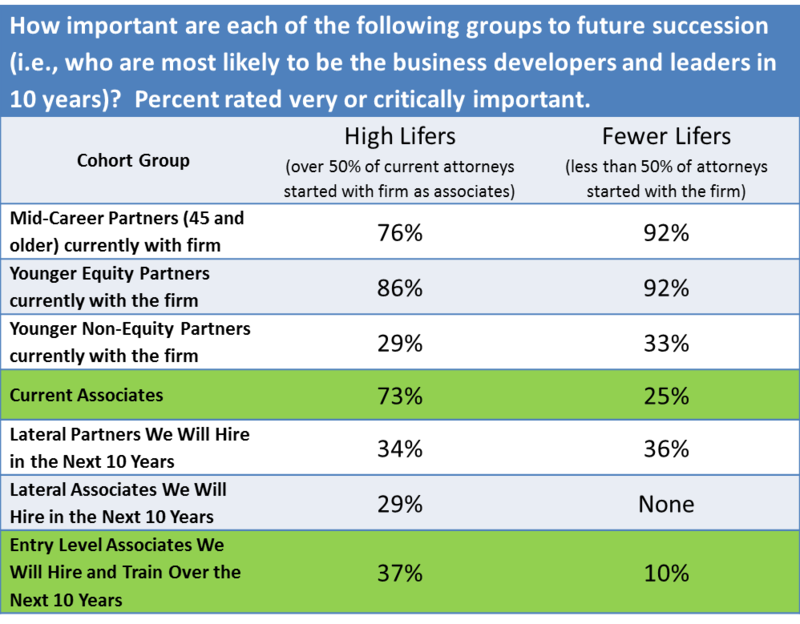 ‘High lifers’ are three times as likely to consider their current associates to be a very or critically important source of future leaders (compared to ‘fewer lifer’ firms). ‘Fewer lifers’ on the other hand only truly have confidence in their mid-career (over 45) and younger equity partners. More broadly, no one expresses much confidence in the ability of future lateral hires to be key players in 10 years. However, there were firms anecdotally expressing great confidence in their laterals. In addition, there is not much confidence in the future prospects of younger (under 45) non-equity partners. While not entirely surprising, the lack of confidence in non-equity partners raises enough questions about their long term role(s) to fill its own blog post. 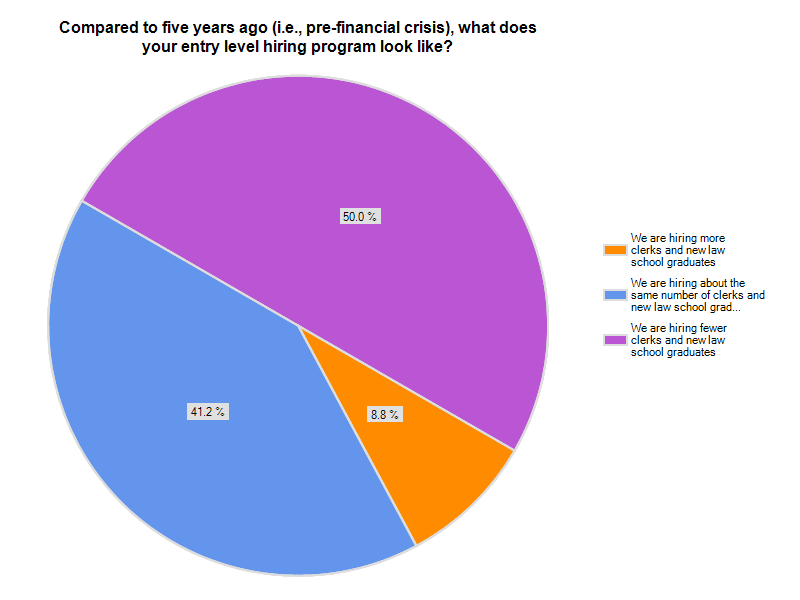 Hiring at the entry level has been consistently lower across the industry – as compared to pre-recession levels. The following pie chart explains why that condition persists quite clearly. Finally, a couple of respondents looked into the proverbial crystal ball and offered predictions about where the future generation of law firm leaders will emerge. As always we thank those who took the time to share their insights with peers and colleagues. Comments are open and we welcome your emails and phone calls as well.